In April 1875, a fiery blaze tore through Ohio's Licking County Courthouse, torching decades of records and generations of family history (for more on the destruction read Family History Emerges From the Ashes). The flames have complicated my efforts to learn the ancestral origins of my 5th great-grandfather Thomas Kirk (1778-1846). His parents are unknown and it's unclear where he was born. Perhaps Virginia based on the majority opinion provided on census records by his children. His earliest known documented appearance in Ohio was an 1806 enumeration on a Licking Township tax list. Unfortunately, Ohio's census records before 1820 were destroyed, so Thomas Kirk cannot be pinpointed using the federal enumerations. Furthermore, the British torched Virginia's 1790 and 1800 census records when they invaded Washington, DC. There's no way to search for Kirk households that included a young Thomas. But what about that tax list? Are there more records like that? What information could they provide about Thomas in lieu of incinerated censuses, probates, and marriage records? I've been working with a research archivist in the Records & Archives Department with Licking County's Courthouse. A couple weeks ago, he discovered a rare mention of Thomas Kirk. This find comes from a bound volume dating to 1840 called the Licking County Auditor Tax Roll. 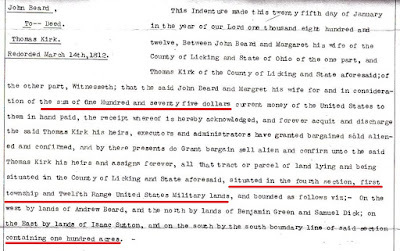 From this record, we learned the exact number of acres Thomas owned in that year, where the land was located, and the estimated value of the property. 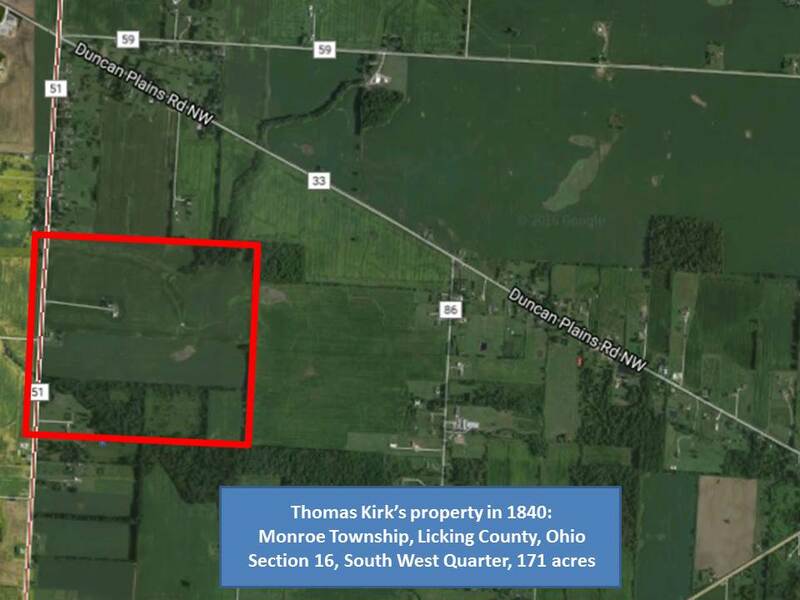 In 1840, Thomas Kirk owned 171 acres in Monroe Township, Licking County, Ohio. The estimated value of the acreage was $512. Clearly, he was an moderately successful farmer who had accumulated modest land wealth. The 171 acres were located in Monroe Township (Range 15, Township 3) in Section 16, South West quarter/lot. 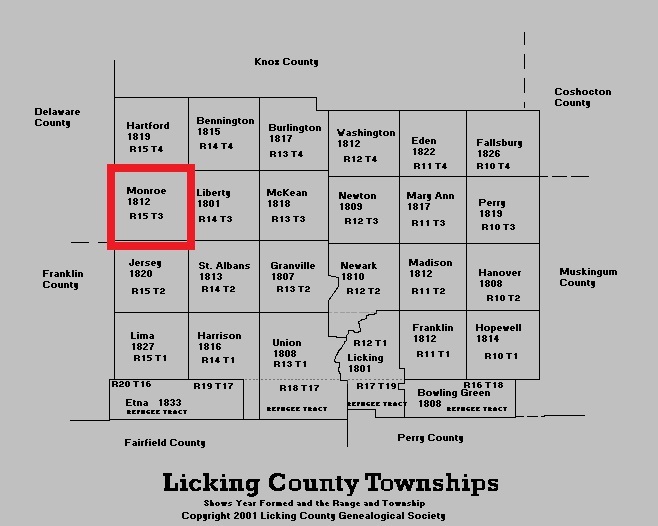 Below is a map of Licking County that highlights Monroe Township. 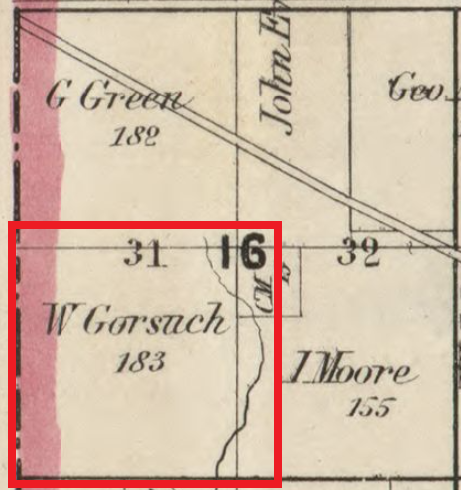 Below is a further close up of Monroe Township's Section 16 from an 1854 map held in the Library of Congress' expansive digital archives. The SW quarter of Section 16 - where Thomas owned 171 acres - was, at that time (eight years after Thomas died), owned by a W. Gorsuch. A current-day Google maps image with the property outlined illustrates the approximate borders of Thomas' land, which was located west of Johnstown. An 1880-built, 3-bedroom, nearly 1600 square foot home sits on the property today. Thomas' home was located in Monroe Township at the time of his death in December 1846. 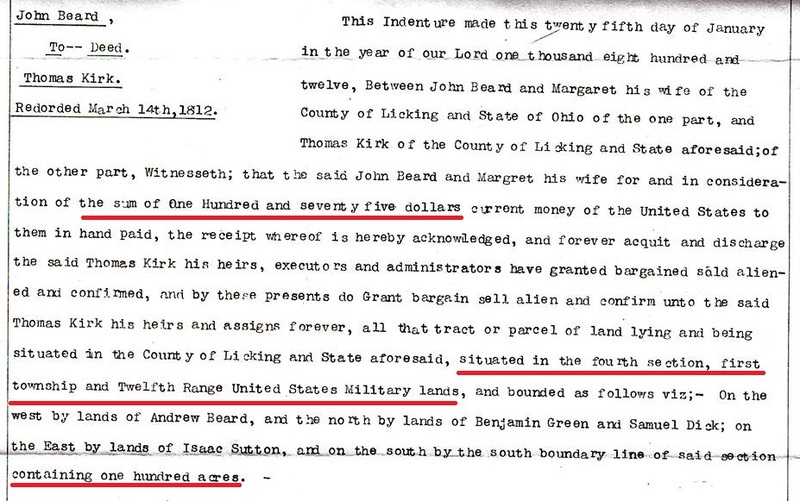 But in January 1812, nearly 30 years earlier, Thomas Kirk paid $175 for 100 acres of land in Licking Township from John and Margaret Beard. Were there tax records from that year and that location that could tell me more about his early life? I turned to the FamilySearch Wiki for Licking County to read up on the area's tax records and made an astounding discovery. 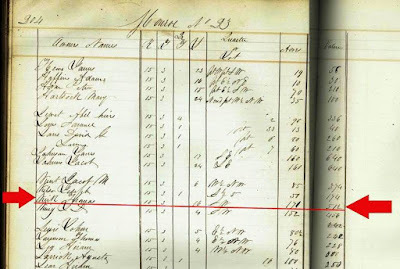 Over 25 years of microfilmed Licking County tax records beginning in 1816 had been digitized and were available online - hiding in plain sight! I had never seen these records because they don't appear on FamilySearch's list of digitized Ohio records (when you click on the map and view all available record sets for the state). As fate would have it, I discovered them late on a work night. Being the responsible adult that I am, I turned off my laptop and set the research aside in order to follow up the next day after work. Ha! Just kidding! I ripped into those records with the excitement of a child opening presents on Christmas morning. 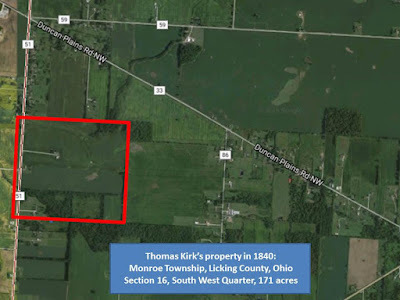 Thomas Kirk's 100 acres were located in Range 12, Township 1 (Licking), and Section 4. His property tax was $2.25 in 1816. In the first decade of tax rolls that I reviewed (1816-1825), Thomas paid a cumulative total of $16.37 in property tax. 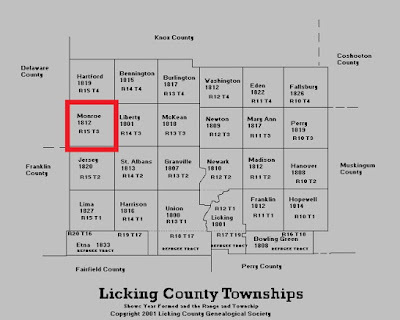 In 1826, the Licking County tax volumes started to include taxes on livestock. Since Thomas' estate package was mostly destroyed in the 1875 courthouse fire, the opportunity to see the appraisal list itemizing his every possession was lost. But the 1826 tax list provided a sliver of insight into his agricultural wealth. In 1826, Thomas Kirk's land was valued at $361 (the first time a property value appeared on the tax roll), which represented a 106% increase in value over his purchase price just 14 years earlier. In 1826, he owned 3 horses (valued collectively at $120) and 5 cattle (valued collectively at $40). Livestock assessments were included in the next eight years of tax rolls. During that time, Thomas owned, on average, 3 horses and 4 cattle a year. Beginning in 1828, Thomas' sons started to appear on the livestock property tax roll with their father. They didn't pay land tax (presumably because they lived with their father), but they did pay tax on their horses and cattle. Curiously, in 1835 the value of Thomas' land more than doubles from $361 to $742. Why would that happen? The acreage didn't increase and there was no written explanation on the tax roll. The family history tells us that Thomas' wife Sarah Bonar died in 1835. Did Thomas inherit some portion of her wealth that had not previously been incorporated into the value of his land? I'm unsure what happened here, but the alignment with the year of Sarah's passing makes me curious if she was a factor. You can't win them all. Sometimes you run into hiccups. The microfilmed tax records for 1837 mistakenly skip the page that included Thomas (seriously, that's the one page you're going to skip?! ), so I'm unsure what he paid in taxes that year (the same year he remarried). Also, the 1839 tax records are not digitized. I'm hopeful the original tax roll isn't missing (why digitize everything through 1838 and then 1840, but skip 1839?). I believe 1839 was an important year of change for Thomas Kirk. He appeared on the 1838 tax list in Licking Township, but in the 1840 tax roll he owned 171 acres across the county in Monroe Township. When did that move happen? The 1839 tax roll could help answer that question (as could a land deed for the Monroe Township property, if I can track that down). It really is remarkable what the tax records have been able to tell me about Thomas Kirk's life. Where he lived. The value of his land and livestock. 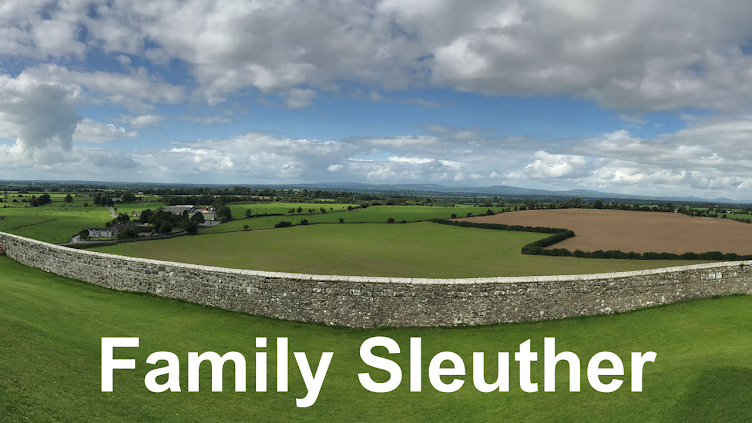 Plus, think of the many family relationships and events they hint at: sons appearing with Thomas (the tax records even helped me pinpoint the year his eldest son my 4th great-grandfather - died), which is more than a pre-1850 census would have told me about that household. Also, a sudden increase in property wealth the same year his wife passed away in 1835 makes me wonder if there are other financial records that I should seek out to piece together that story. The search continues thanks to the aid of an unconventional yet genealogically-rich set of records. I'm sure Thomas didn't love paying his taxes, but I'm sure happy and thankful that he did!